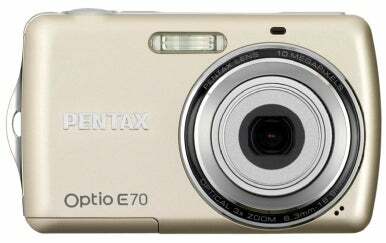 Pentax’s Optio E70 is a compact, intuitive, and fun camera that is a cinch to use. It fits easily in your pocket, and it has enough modes to handle whatever lighting or subjects you encounter. While chock-full of features, this streamlined model is also great for beginning photographers who just want an inexpensive camera for snapping reasonably good digital photos. The Optio E70 has 18 shooting modes, but that impressive number should not scare off beginners. Big, easily-recognizable icons depict each mode on the menu screen. For instance, little moon and a building represents the “night scene” mode, while a dog icon represents the “pet” function, allowing the user to match the animal’s hue during movement and take a picture without fear of motion blur. You can select a mode or allow the Auto Picture mode to select one for you. For the more technically savvy photographer, a “program” mode lets the user adjust settings for flash, focus mode (standard, macro, pan, and infinity), recorded pixels, focusing area, ISO (64 to 800), blink detection, and exposure. By clicking on the Auto Pict icon, the camera will cycle through seven shooting modes to deal with any given situation. Although this saves amateurs a lot of menu scrolling, its selections may not always be what you would expect. I found that Auto Picture would stick to portrait or landscape modes when handling most subjects, but curiously, it switched to sport mode when I was shooting an office plant and remained in portrait mode when I tackled active subjects in motion. Pentax touts the camera’s abilities to take portraits. The Face Recognition feature automatically detects up to 32 faces in the frame and sets the focus while adjusting the exposure. When you press the focus button down halfway, a yellow face-recognition frame lets you know it detects a face in the picture. If it recognizes multiple faces, it frames the main portrait in yellow and the others in white. In my experience, however, it was easy to get one face recognized by the camera, but harder to get other faces in the screen framed except in ideal outdoor lighting. On the whole, the Optio E70 produced decent images. In particular, the camera seemed to shine with outdoor lighting but to overcompensate for poor lighting indoors by producing photos with unnaturally rosy skin tones. The Optio E70 has a 2.4-inch LCD. If you have Face Recognition enabled, the camera will also inform you if someone’s eyes were closed in the Instant Review screen. Pentax also offers a smile detection feature that will automatically release the shutter when a person’s smile is detected. For users with difficult children to photograph for the annual family photo, this feature would be particularly appealing. But I found that sometimes, even when all conditions for such shots had been met and the subject smiled for a full minute, the shutter still would not release. Other times, it worked instantly without a problem. Ultimately I turned the feature off and I just handled things manually. The Pentax’s battery life earned a Good rating in our lab tests (the unit took some 285 shots before the batteries expired). The camera’s use of AA batteries make it ideal for traveling, and users who want a more environmentally sensitive battery system can always purchase rechargeable AAs. The maximum number of megapixels for the Pentax is 10, which is standard on many point-and-shoot models, though some now go as high as 12.1 megapixels. The maximum resolution for the Optio E70 is 3648 by 2736 pixels. Our jury of experts judged the E70’s pictures overall to be of Good quality, but also noted that the sharpness of the images was not on a par with competing cameras. In my own experiences with portrait mode, photos had a tendency to look airbrushed and to lack detail. Skin tones often appeared reddish, and faces looked sunburned, particularly in the viewfinder but less so when the photos were imported to the computer. The flash, color, and exposure tests all received Good ratings, as did overall image clarity. The Optio E70 has the ability to take short movies (with audio). The optical zoom can be set before recording, but only the digital zoom can be used during recording. You can choose different pixel settings for your recordings, ranging from 640 by 480 at 30 frames per second (ideal for viewing on TV) to 320 by 240 at 15 frames per second (ideal for viewing on a Web site or in e-mail). Users can choose only between NTSC or PAL formats in video output. The video capabilities of the Optio E70 won’t put your camcorder out of a job, but for short videos (30 seconds or so), the camera is satisfactory. It was color accurate, and the sensitive mike picked up most of the audio I needed to capture the event I was recording. The Optio E70 is available in Champagne Gold, Wine Red, or Deep Blue. The Optio E70 is good for beginning photographers who don’t want to bother to learn the nuances of exposure, framing, and lighting. The E70 does most of the work for you with its preset modes and Auto Picture feature, but still offers experienced photographers features that they’ll appreciate and use. Underwhelming sharpness and detail loss with portraits detract from the overall impressiveness of the E70, but amateur photographers who want to preserve memories from a vacation will find this model a worthy buy.